Some of the most dangerous fire hazards in your home are innocuous, and things you might not even think about on a daily basis. While safety measures, such as smoke alarms and fire sprinklers, can provide some peace of mind, it’s better to ensure a fire never starts at all by pursuing methods of fire prevention. Here are just a few things you might want to keep a close eye on in your home, to prevent any possibility of a fire now or in the future. Did you know that cleaning out your dryer lint can reduce your risk for a home fire? A considerable amount of fires start in the home every year due to a build-up of lint in the family dryer. Heat will build up in the dryer during a normal cycle, and heat plus a large amount of dry lint is a recipe for disaster. Be sure to clean out your dryer’s lint filter each time you run it. It turns out that the kitchen is the most fire-prone place in most homes. While most people would assume that kitchen fires are generally started by a stove or oven, most homeowners are stunned when they learn that many home fires start in the toaster. After repeated use, a toaster can begin to pile up old crumbs and dust at the bottom of it’s innards. Initially, these old crumbs may simply cause smoke – something that a lot of cooks see frequently, and don’t worry about too much. A spark can easily catch in these toaster crumbs, however, and start a flame that catches on to the items around it. Be sure to clean your toaster out on a regular basis to reduce any possibility of a home fire. Cases of fires caused by unexpected electrical faults have proven fatal time and time again. 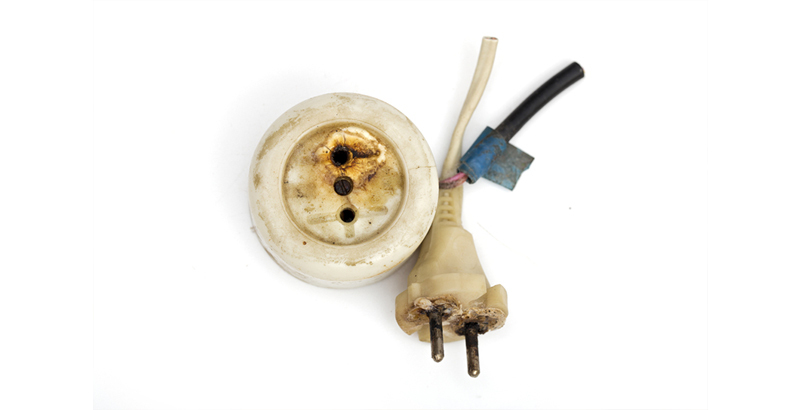 Old appliances can have frayed wires in places that aren’t obvious, and internal mechanisms can begin to wear-out and prove to be a fire hazard. Likewise, loose electrical outlets can be a difficult to detect hazard – any outlets that wiggle on a regular basis should be tightened or replaced. Many homeowners assume that, if a fire starts at their home, it will be in the interior of the home. Brush fires or wild fires can be a real danger, depending on the area you live, the season, and the local fire risk level. Allowing leaves to gather up in your gutters, bushes to overgrow, or branches to gather on your lawn can all pose a fire risk. If you area is in danger of wildfires, be sure to take care of your gutters and your lawn to reduce the risk of a fire in or around your home. Home improvements should always be done by a skilled professional: if crucial improvements are done improperly, the risk for a fire shoots through the roof. Some homeowners, in an effort to save money, will attempt to do work on their homes on their own, including critical wiring projects that require a good deal of knowledge to do properly. Likewise, hiring the right person to do your home improvements is important – the smallest error in home improvements can mean the difference between a safe home and a fire waiting to happen.